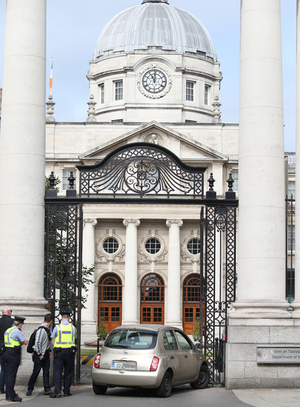 A woman was reportedly arrested after a car crashed Into the gates of government buildings. 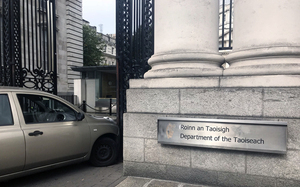 Posted in Misc and tagged crash, Taoiseach's office at 11:22 am on August 21, 2018 by Bodger. 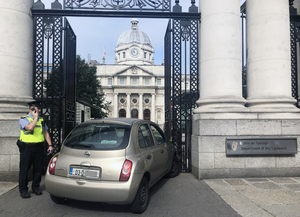 Cue Mary Mitchell O’Connor jokes in 3,2,1…. It’s time to smash that glass ceiling…or in this case an iron gate. I heard she was looking for Trinity College..
that guard doesn’t run much, does he? By the time you typed the countdown it was too late. You made it. If this was in the UK it would have been a terrorist attack. Scarlet for her and her faction if it is! Were the gates open before the crash? Like, did she try to crash through the gates in a rage or did she just accidentally hit the side of the gate through drunkenness or incompetence or something? Here’s hoping it’s the start of the revolution. Micraphobia. The last acceptable prejudice. 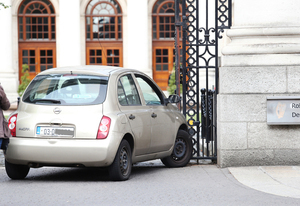 The revolution has begun….with a belligerent Nissan Micra!! 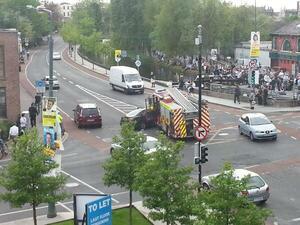 This HAS to be just some aul’ wan who took a wrong turn. ..or took a bad turn? No, didn’t you read ‘one’ woman. The other 3 are nuns on the run. Nun of this, nun of that and nun of the other. That’s all my nun material. The woman is believed to have been radicalised after visitng the world meeting of families. 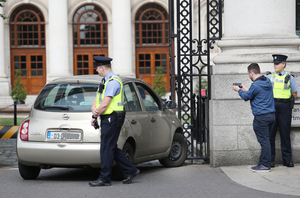 if ya wanna attack politicians, the last place you’ll find them is the Dail.